John Gee, A Guide to the Joseph Smith Papyri. Foundation for Ancient Research and Mormon Studies, 2000, 67 pages, photos. 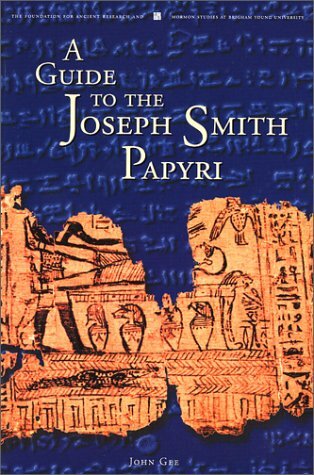 In his introduction, John L. Gee, PhD, writes “This guide has been prepared to provide basic information about the Joseph Smith Papyri (JSP) and an overview of the discussion about the connections they may have with the Book of Abraham for those who have no knowledge of Ancient Egypt and perhaps little of the Latter Day Saints.” For the most part, this publication fulfills those goals. It reads easily and has very good color copies of some of the JSP. However, it leaves out or glosses over some very important information. One example of this is in Gee’s explanation of Facsimile 2 of the Book of Abraham (BoA). On page 33 Gee notes that, “A sketch of Facsimile 2, made in 1842, probably by Willard Richards, shows areas of that facsimile that were damaged.” However, he does not indicate where that sketch can be found, which is in the Joseph Smith Egyptian Papers. Nor does he mention that, in the original publication of Facsimile 2, the missing and damaged areas were filled in (1) by copying text or figures from other portions of the JSP or (2) by the artist’s creativity/inspiration. "The reader should be warned that information that does not agree with the LDS viewpoint is often omitted or glossed over." I read this to gain an understanding of the LDS position on the JSP. I was especially curious as to how Dr. Gee would answer some of the criticisms that have been raised by Egyptologists and others. For example, Egyptologists disagree with Joseph Smith’s identification of the figures in Facsimile 3 of the BoA. I was disappointed to find that Dr. Gee does not address this criticism, except to state that two of the figures in female attire, that Joseph Smith identified as male royalty, may be men dressed as women. Except for that comment, Gee does not try to justify any other aspect of Joseph Smith’s Facsimile 3 explanations. In his explanations, Joseph Smith not only identified all the figures, but also claimed that there are Egyptian characters on Facsimile 3 that identify three of the figures. For example, the explanation for figure 5 is “Shulem, one of the king’s principal waiters, as represented by the characters above his head.” According to Egyptologists, there are no characters on Facsimile 3 that translate to Shulem. The person Joseph Smith calls Shulem is, in fact, Osiris Hor, the person for whom the papyrus was written. This publication is of value to anyone who wants a quick overview of the JSP and is curious as to how a FARMS scholar counters some of the “anti-Mormon” criticisms of the Book of Abraham. However, the reader should be warned that information that does not agree with the LDS viewpoint is often omitted or glossed over.